Centralmente ubicado a 3 cuadras del Parque Santiago ya 6 cuadras de la Plaza Grande esta hermosa casa es de 3000 pies cuadrados con una sala de estar y TV de pantalla grande, comedor con capacidad para 6 (asientos adicionales para 4 en la terraza), amplia totalmente equipada cocina, 3 habitaciones, todas con su propio baño y aire acondicionado y 2 terrazas cubiertas con vistas a la piscina grande (no es una piscina de chapoteo) y el hermoso jardín tropical. También hay un garaje para estacionamiento en la calle. La casa está en una calle tranquila sin salida que elimina gran parte del ruido del tráfico común a muchas de las calles del centro. CHECK IN ES 4 PM Y CHECKOUT ES 11 AM. SALIDAS Y LLEGADAS TARDE TEMPRANA les acogerá cuando sea posible. We enjoyed the location of the house rental. It was very close to the center of town and it was easy to get to other places. The only issue we had is the water pressure of the toilets and the next door rooster. The water pressure issue is very common in Mexico so totally understandable. The rooms were great and we enjoyed the the swimming pool at night to decompress and helped us deal with the heat. L’appréciation d’un séjour de vacances vécu dans une résidence privée est une évaluation hautement subjective. Elle dépend du degré d’objectivité, de l’expérience acquise, de la tolérance vis-à-vis les inconvénients et de la nature des besoins recherchés. Nous habitons une ville et un pays au climat hostile en hiver (Montréal, Canada) et l’un des critères de sélection de nos destinations hivernales est certes la température de février. Cette année, ce fut Mérida, sa culture, son patrimoine sa gastronomie et la Casa del Amber. Le mois de février au complet fut réservé. Considérant les prétentions du propriétaire vis-à-vis les avantages de sa villa et du quartier où elle est située, ce logement est tout simplement fantastique. Tout est absolument conforme, tout est en parfait état de fonctionnement, l’intérieur est meublé avec qualité et goût, l’extérieur n’est rien de moins qu’un oasis tropical et luxuriant. Les dialogues avec le propriétaire furent précis et diligents, les contacts avec la gérance furent tout aussi rapides et efficaces et la femme de ménage s’est toujours présentée avec un magnifique sourire. Vivre au sein de la plus vieille ville précolombienne d’Amérique, c’est Mérida. Vivre un peu à l’écart du deuxième plus important centre-ville du Mexique, c’est la Casa del Amber. Vivre dans une oasis de fraicheur et d’exotisme, c’est le jardin arrière. The appreciation of a holiday stay lived in a private residence is a highly subjective evaluation. It depends on the degree of objectivity, the experience acquired, tolerance vis-à-vis the disadvantages and the nature of the needs sought. We live in a city and a country with a hostile climate in winter (Montreal, Canada) and one of the criteria for selecting our winter destinations is the February temperature. This year it was Mérida, its culture, its heritage, gastronomy and Casa del Amber. The entire month of February was booked. Considering the statements of the owner vis-à-vis the benefits of his villa and the neighborhood where it is located, this accommodation is simply fantastic. Everything is absolutely in conformity, everything is in perfect working order, the interior is furnished with quality and taste, the outside is nothing less than a tropical and lush oasis. The dialogues with the owner were precise and diligent, the contacts with the management were just as fast and efficient and the cleaning lady always presented herself with a magnificent smile. Living in the oldest pre-Columbian city in America is Mérida. 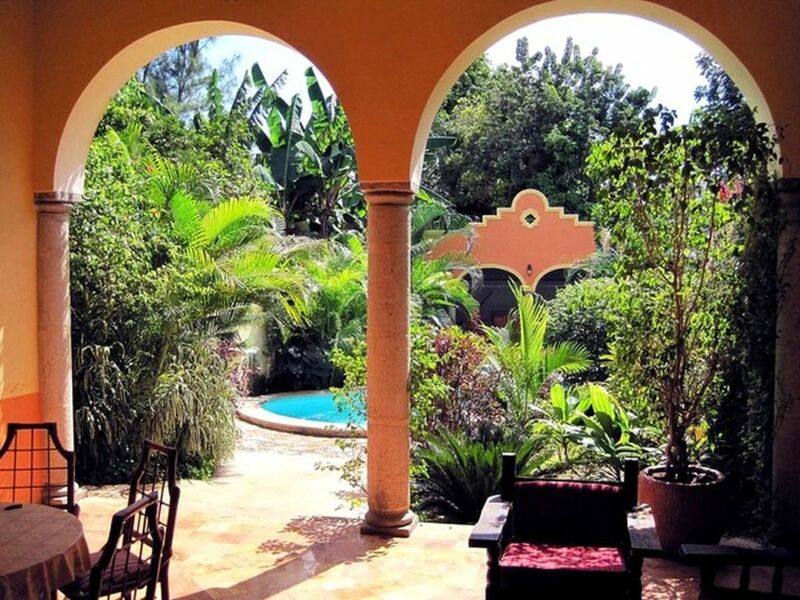 Living a little away from Mexico's second-largest city center is Casa del Amber. Living in an oasis of freshness and exoticism is the back garden. Very comfortable beds, living room area. Plenty of space for family gatherings. Large kitchen with updated cookware. Area is safe to walk. Markets and grocery stores are close by. Outdoor living area is great. Comfortable outdoor furniture, large pool. Very well kept. Artistic colors were very well done. Being in a residential area, expect noises such as dogs and roasters. Open concept makes it hard to block the noise, but allows plenty of fresh air. Would be better if there had been a safe. Property as advertised. What it doesn't say is the convenient location for road travel east, south and north. Our midsize SUV fit easily into garage. We found house and garden in good order and well stocked. There were convenience stores close by, and corner store two blocks east and two blocks north. We stopped at stores selling fresh fruit and vegetables. Used lyft for in town driving. Great time had by all. We rented this house for 31 days and they say first impressions are everything but unfortunately our first day was not very pleasant. The house is ok if you are going to stay for one week. The backyard with the pool is the BEST asset of the property. Location is good and you can walk to Mercado Santiago and also there is a bakery nearby on Calle 72. There is a lot of traffic, many busses and a dog kept barking day and night! The house itself lacks attention to details. Many things and rooms in the house need maintenance and cracks in sinks and walls need to be addressed. On my first morning I had to clean some items in the kitchen and the terrace was dirty. I called the property manager and she took care of my complaints but I wasn’t expecting to clean during our vacation not to mention that my husband fell ill due to an infection. NOTHING RELATED TO THE PROPERTY. The kitchen is missing a few items is not like other properties we had stayed before where the owner thinks of every single detail that makes the guests feel welcome. There is not enough water pressure in the bathroom showers. Again the house is not that bad but the owner should invest some money taking care of important details like replacing some things like the mattress covers, and adding some small bowls in the kitchen and fixing the drinking water pumps dispensers, etc. They provide a little bar of soap in the bathrooms and then you are on your own. One of the bathrooms has a fowl smell coming out of the toilet and there is only AC in the bedrooms. I shared my comments with the owner separately but I never received an answer. He is not very friendly either and he indicated he would reimburse me for the first night and never did. Although after one week he gave me the option to look for another property and since my husband was in the hospital I couldn’t deal with the issues in the house. The only money I got back was my deposit. Would I stay again at this property? Definitely not. To be honest with you I don’t think the owner cares very much. He has a property manager who takes care of things her own way. Perfect location,good sized supermarket a few blocks away. A very responsive management team and a very quiet, bus free street made it the ideal VRBO..
Casa de Ambar está situado en un barrio tranquilo en el corazón del Centro Histórico, a poca distancia de restaurantes, museos, teatros y festivales semanales con música en vivo y baile. Las playas de la costa de Yucatán se encuentran a 30 minutos en coche, donde la natación, la pesca y la gran mariscos restaurantes están disponibles. Muchos de los importantes hay que ver las ruinas mayas al sur de la ciudad son de fácil acceso en coche o en autobús. Mérida es una ciudad maravillosa con muchas atracciones, y después de un día lleno de actividad, el jardín y la piscina en la Casa de Ambar es un gran lugar para relajarse.